As the snow melts away, the green grass begins to emerge, trees begin to bud and the robins come out to play. Yes, spring is in the air and at Deep Creek Lake that means it is time to dust off the HIKING boots and head outside for some outdoor adventures. An absolute must-do in Garrett County is visiting Swallow Falls State Park. 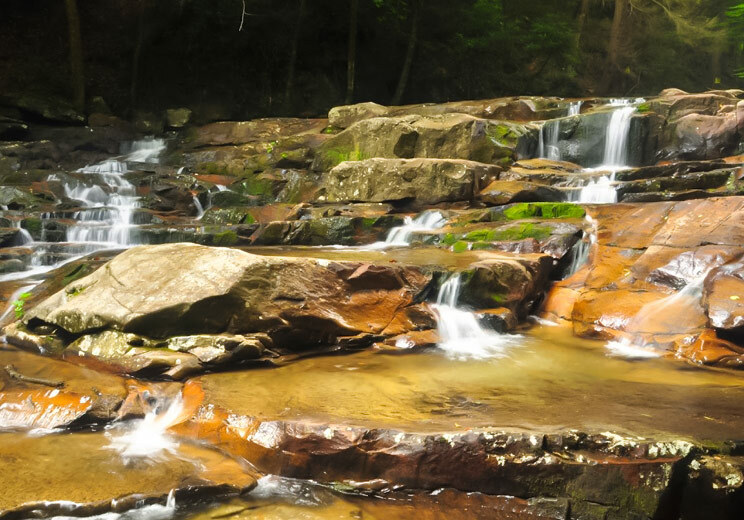 Take a short hike down the wooded trails and witness the sheer beauty of Swallow Falls and Muddy Creek Falls, the highest waterfall in the State of Maryland. Mother Nature does not disappoint. Do you have a flair for fishing? Then rent a canoe and head out onto the lake for some early morning casting. You just might catch "the big one”. Looking for something the whole family will enjoy? Gather up the little ones and head over to the discovery center at Deep Creek State Park. Surrounded by exhibits that showcase the natural resources of Western Maryland, you are sure to experience a one-of-a kind educational experience. If you are looking for that optimal adventure, head to the Adventure Sports Center International, a unique outdoor adventure habitat that features the world’s premier, controlled whitewater course. Guaranteed to give you an adventure of a lifetime. Horseback Riding – Deep Creek Lake has a few different stables to choose from, for some enjoyable scenic guided horseback riding. I believe they even do Pony Rides for the kiddies! Golf – Deep Creek Lake has a variety of golf courses to choose from. Mountain Biking – Deep Creek Lake has plenty of fun mountain bike trails. Herrington Manor has a great trail that leads to Swallow Falls State Park, plus there are other various biking trails to check out throughout the state parks & forests. Wisp has freeriding through their mountain on natural rocky terrain & wooden ramps and bridges. They even supply tours to take in the whole experience. Don’t feel like packing the bike? You can rent mountain bikes at different outdoor shops in the area. Fishing – Deep Creek Lake is habitat for large and small mouth bass, walleye, yellow perch, northern pike, chain pickerel, brown & rainbow trout, black crappie, rock bass, bluegill, red eared sunfish, yellow bullhead, common carp, and golden shiner. Check out http://www.fishdeepcreek.com/ for more information on where to find these fish in the lake. We also have local rivers for some great fly fishing. Take a fly fishing excursion with PJ from Savage River Angler or go on a family boat tour with Bill’s Outdoor Center. Hiking - With over 76,000 acres of parks, lakes, and publicly accessible forestland, you are sure to find the perfect hiking trail! There are 6 state parks, with all but one (Casselman River State Park) having hiking paths. We have everything from easy to expert trails to choose from. Swallow Falls State Park has the highest waterfall in Maryland and has a number of other falls to check out as well. Kayaking – You can rent a kayak and have it delivered to your vacation home to enjoy the lake at your own pace or take a tour on Deep Creek Lake with High Mtn. Sports or check out Savage Reservoir with All Earth Eco Tours. Farm Tours – Meet & feed local farm animals and learn about their care and feeding. Fun for the whole family! White Water Rafting – Spring the best time to navigate the local rivers on guided tours on the Youghiogheny and Cheat Lake Rivers. Test out Adventure Sports Center man made river (only 2 in the country) for some fun guided tours. This is a great river to try out for the first time and even if there are some non-rafting people in the group they can watch and take pictures as you go by!